After six months of looking at stuff we couldn't afford. My family and I finally found a lot to build our house on. It's not huge, about a 1/4 acre but the view is perfect. 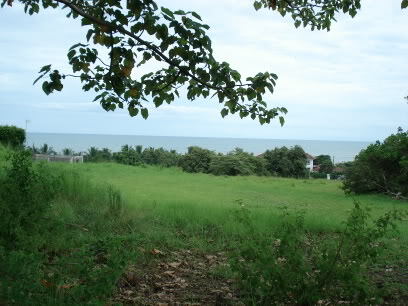 It is located in a gated weekend community called Costa Esmerelda about an hour from the city. The owner wanted 60k but we agreed on 55k. Based on other lots we have seen it is worth about $78k. These pictures were taken with our architects as we plan the best way to take advantage of the view. For those interested, it costs about $50 (cheap labor) per sq ft to build here in Panama. It can be higher if you opt for marble, granite and other expensive items. The major obstacle to building here is in the short supply of dependable labor because of the construction boom going on in the city. I'll be taking notes along the way for a project that I have in mind later and will post pictures as we progress. Another note, here is Panama it is currently rainy season so we will wait till January (our summertime) which is the dry season to start building. This will give us plenty of time to finalize the plans and hopefully limit the amount of changes and costs during construction. 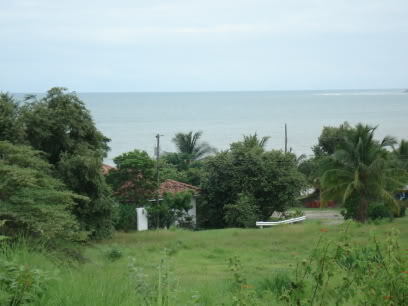 Here's a pic of the beach which is about a 5 min walk away. 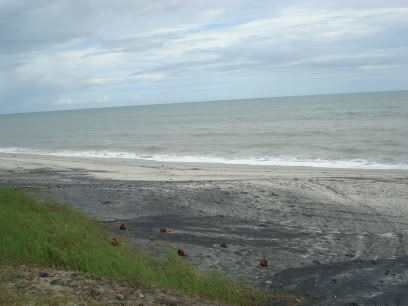 Panama beaches on the Pacific side all have the same black and white mix sand. From what I've been told the black sand comes from the iron ore in the ground. Very nice! Would love to see the plans when you have them. How well do they regulate stuff like water quality and sewer/septic systems down there? The water is actually really good. Not sure if So CA is still the same but I remember having to "wait" until the sediments settled, this was before bottle water. Here the water is crystal clear from the tap. We will have to install a septic system on our lot. Shouldn't be a big deal as other homes have already been built in the area so we won't be the first dealing with the poop issue. We will have to install a septic system on our lot. Shouldn't be a big deal as other homes have already been built in the area so we won't be the first dealing with the poop issue. Installation isn't a big deal. * *It's a bigger deal when your neighbors systems start to fail and either leaches into your water supply or onto the beach. * *If you have a city water hookup, then it's less of a deal. We're on a septic system here near Puget Sound. * *In the shallow areas, leaky septic systems will leak "nutrients" into the sound and cause algal blooms. * *When the algae die, they are decomposed by anaerobic bacteria. * *The result can be a beach that smells like sulphur dioxide (toxic and stinky). wow, that's gorgeous. and what amazing prices. is there any good snorkling there? what's visibility, the pics (hard to tell, but) look a little murky. is the beach public? any place you could secure a hobie cat near the water? It's a bigger deal when your neighbors systems start to fail and either leaches into your water supply or onto the beach. If you have a city water hookup, then it's less of a deal. We're on a septic system here near Puget Sound. In the shallow areas, leaky septic systems will leak "nutrients" into the sound and cause algal blooms. When the algae die, they are decomposed by anaerobic bacteria. The result can be a beach that smells like sulphur dioxide (toxic and stinky). Thanks for the heads up. I'll definately check that out as I never thought about that happening. Nothing like a cess pool to drive home prices (down). I haven't investigated the snorkling there although there seems to be a lot of surfers on the day I took the picture. We've been out there a few times and it seems that when it's high tide the waves pull the black sand into the ocean giving it a murky look. 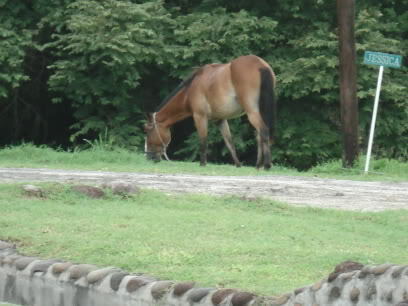 Also those pics were taken about 20 minutes after a typical Panamanian rain downpour. On calm days it's blue and picture perfect. Technically the beaches are public but you can access them in certain areas. For instance, our area has a guard and unless you own property or are visiting someone, he won't let you in. However, if you travel 10 minutes up the road you can access the beach there and walk back maybe 30-40 minutes to our area. Most people don't bother as we were the only ones within earshot of the beach other than the surfers who were probably 400 mtrs away. There's no place to secure one although most folks store equipment like that in their yard. i seem to remember from when i lived on st croix usvi that the beaches were also (technically) public up to the high tide line. when i lived across the street from a nice lake in florida i had a sunfish hooked up on a makeshift trailer. i'd roll it across the road everyday after work for a sail. easily managed by myself. maybe you can do something like that if you're into it. it'd give you great use of all that water. you could do something with big tires to get across the sand. Very nice. Hope the building goes well. What are the taxes projected to be? What is your budget for construction? Which months make up rainy season there? How much precipitation do you get during rainy season? Is it the regular-but-quick thundershower type rain or is it slow and steady? The rainy season runs from about April to the begining of December. It varies as far as whether it's pour down cats and dogs or just a light rain all day. On average it rains about 3-4 days a week during the season and rarely rains during the dry season. Good thing is that during the rain season it generally gets down in the 70s at night and 85-90 in the day. Humidity varies by day although after six months I hardly ever feel overwhelmed by it. However once I go to the US and return to Panama the AC is on full blast for a couple of days till I climatize again. We only pay taxes on the land and have a tax exoneration for 20 years on the house. Our budget is fluid but should come in around $50 per sq ft. My wife and I are going back and forth about the final total sq ft so I am more concentrated on the price/sq ft.